To people with autism and Asperger syndrome, the world can appear chaotic with no clear boundaries, order or meaning. These disorders can vary from very mild, where the person can function as well as anyone else around them, to so severe that they are completely unable to take part in normal society. People with autism are usually more severely disabled, while those with Asperger syndrome tend to be more able, although this isn't always so. Because of the range of severity and symptoms, the conditions are collectively known as autistic spectrum disorders. They affect more than 580,000 people in the UK. Difficulties with social interaction - being unaware of what's socially appropriate, finding chatting or small talk difficult and not socialising much. People with autism may appear uninterested in others and find it very difficult to develop friendships and relate to others, while those with Asperger syndrome are more likely to enjoy or want to develop social contacts, but find mixing very difficult. Problems with verbal and non-verbal communication - those affected may be able to speak fluently or, more commonly in autism, may be unable to speak at all. There may also be difficulties understanding gestures, body language, facial expressions and tone of voice, making it difficult to judge or understand the reactions of those they are talking to or to empathise with people's feelings. As a result, they may unintentionally appear insensitive or rude to others. They may also take others comments literally and so misunderstand jokes, metaphors or colloquialisms. Lack of imagination and creative play - such as not enjoying or taking part in role-play games. They may also find it difficult to grapple with abstract ideas. There may be overriding obsessions with objects, interests or routines, which tend to interfere further with building social relationships (this is known as stereotyped or repetitive behaviour). These behavioural difficulties can cause a great deal of stress for members of the family. A child with autism may appear unaffected as a baby and reach the usual developmental milestones, including early speech. But as they grow into toddlers, they may fail to develop normal social behaviour and speech may be lost. * Repetitive behaviour and resistance to changes in routine. * Obsessions with particular objects or routines. * Difficulties with fine movement control (especially in Asperger syndrome). * Absence of normal facial expression and body language. * Lack of eye contact. * Tendency to spend time alone, with very few friends. * Lack of imaginative play. 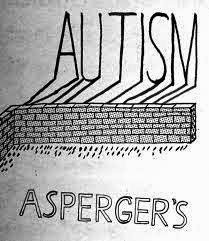 People with Asperger syndrome are usually more mildly affected than those with autism. In fact, many people with milder symptoms are never diagnosed at all, and some argue that Asperger syndrome is simply a variation of normal rather than a medical condition or disorder. Even so, many do find that it gives them particular problems getting on in the world and they may become aware they are different from others. This can result in isolation, confusion, depression and other difficulties, all of which could be defined as 'disease'. Some children with Asperger syndrome manage (or in fact even do very well) in mainstream schools, especially if extra support is available. However, even when children cope well academically, they may have problems socialising and are likely to suffer teasing or bullying. More severely affected children need the specialist help provided by schools for children with learning disabilities. With the right sort of support and encouragement, many with Asperger syndrome can lead relatively normal lives. Helping them develop some insight into the condition is an important step towards adjusting to, or at least coping with, the way the rest of the world works. Some do very well, especially in an environment or job where they can use their particular talents. Autism tends to produce more severe symptoms. For example, a child with autism may fail to develop normal speech (the development of spoken language is usually normal in Asperger syndrome) and as many as 75 per cent of people with autism have accompanying learning disabilities. Seizures are also a common problem, affecting between 15 and 30 per cent of those with autism. Conversely, children with autism are sometimes found to have an exceptional skill, such as an aptitude for drawing, mathematics or playing a musical instrument. The cause of autistic spectrum disorders is not yet clear. Genetics play an important role, and researchers are examining a number of chromosome sites that could be implicated. It's likely that autism occurs when a small number of genes interact in a specific way, possibly linked to some external event or factor. This genetic link means there may be an inherited tendency, so autism and Asperger syndrome may run in families. Brothers or sisters of a child with the condition are 75 times more likely to develop it themselves. Doctors' ability to diagnose these disorders has improved in recent years, but older people, particularly with milder problems, may never have been diagnosed. When a child is diagnosed, parents often realise they've had the same problems themselves. Boys are more likely to be affected than girls, though research suggests that when girls have the condition they may be more severely affected. A variety of other environmental factors that affect brain development before, during or soon after birth, also play a part (possibly acting as a trigger). Despite reports suggesting a possible link between MMR vaccination and autistic spectrum disorders, scientific evidence has confirmed the vaccination does not increase the risk. There's no specific test for autistic spectrum disorders. Diagnosis is based on a consideration of symptoms, and milder cases may be missed. There is no specific cure or particular medical treatment for autism, but much can be done to maximise a child’s potential and this is key to managing the condition. Appropriate specialist education, speech, language and behavioural therapy are all important. There are many different approaches (for example, the Lovaas method is an intensive behaviour therapy approach, while the Son-Rise programme is focussed on relationships). Other interventions are based around theories about possible causes of autistic spectrum disorders – these may for example involve using foods and supplements, or medicines, which might affect the mechanical, physical and biochemical functions of the body. While many people feel they've achieved good results with some of these interventions, none of them is a cure-all, and many lack scientific evidence to demonstrate their benefits. Others claim dietary changes or alternative remedies have helped, but these, too, are mostly unproven. Medication is sometimes recommended when it's felt to be of benefit to the child, for example to control seizures, depression or other symptoms. As the precise events that lead to autistic spectrum disorders aren't yet known, it isn't possible to prevent them. Neither is there yet a simple screening test to identify people carrying genes that might increase susceptibility to autism.